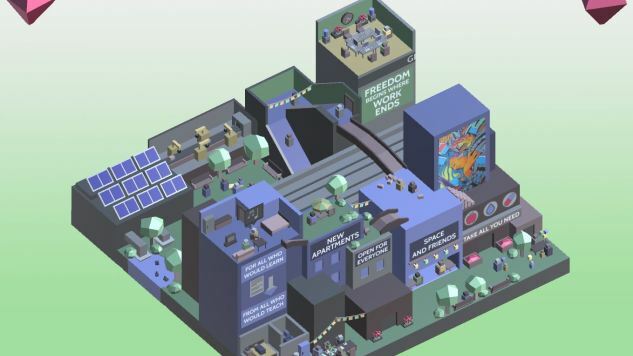 POST/CAPITALISM , developed by the game designer Colestia, uses the trappings of a city simulator to illustrate the ways that a city functions as a collection of interlocking systems, and that by changing these individual systems, the city itself can evolve past a harmful existence. It’s an educational game, in a sense, but it’s also a rather intriguing puzzle game in its own right. There’s a strange push-and-pull in educational games, where often the educational side or the game side of the project becomes de-emphasized in favor of the other. A game will become more lecture than game, or vice versa. Oregon Trail was developed by MECC in the ‘70s to be an educational vector for children to learn about what really was a system of (mostly) white American expansionism into the West. But Oregon Trail isn’t memorable for the vignettes of notable landmarks as much as it is for the systems that power the travel experience along the trail. While I hesitate to define games-as-artform as doing anything wholly unique, the way that they can teach systems to players is remarkable even among their artistic contemporaries. Where POST/CAPITALISM thrives is in how it demonstrates change via systems, something that games are structurally skilled at doing due to their nature as systemic creations. By manipulating single items within the one-block cityscape (such as factory lines, shopping outlets, and workplaces), the block itself changes. Turning a grocery store into a public food kitchen means that more citizens are fed and receive healthcare, but unless you also fix the underlying conflict that resources for the poor are underproduced, you can’t fix the line of homeless outside the door. Dragging two items on top of one another creates a symbolic representation of the conflict at its core, and allows you to change it on an ideological level. In the example I brought up, dragging the “grocery store” item onto the “line of homeless” item creates a marker of the ideological conflict that prevents the system from working. In this way, the game breaks down what is, on paper, a rather complex relationship into an easily-understandable systemic interaction: fix the ideology that prevents good things from happening, and suddenly you can make good things happen. I’ve written before about the criticisms I have with Cities: Skylines, a charming but flawed city-building game developed by Colossal Order. Cities: Skylines also had a clear vested interest in an advancement of the “city” toward a more equitable and eco-friendly institution, but unlike POST/CAPITALISM, it never interrogated the ideologies at the core of its inequalities, and ultimately this is where it lost me. POST/CAPITALISM succeeds because it does interrogate these ideologies. No one wants to live in a city overtaken by homelessness and poverty, or with jobs that leave us tired and frustrated at the end of the day. POST/CAPITALISM tells us that the problem isn’t the homeless, or the lack of resources, or the jobs, but the ways that people are kept in systems of inequality. Ostensibly it’s a puzzle game, and an educational game by design, but its greatest success lies in its optimism for a future that can be changed, bit by bit, chipping away at actionable items to reveal and change the harmful beliefs at their core.